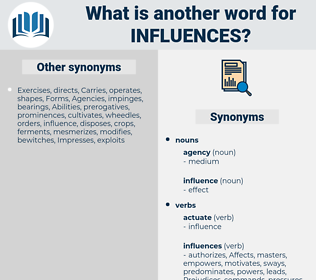 What is another word for influences? factors, considerations, determinants, elements, facteurs, drivers, effects. circumstances, factors, relevance, Incidences, Affects, repercussions, forces, preferences, ways, inclinations, receipts, Voices, externalities, interventions, leanings, reactions, considerations, inputs, contributors, outcomes, bearings, conditions, substances, pressures, coefficients, Roles, circles, fundamentals, sources, traces, belongings, insurgents, powers, ingredients, determinants, pieces, proceeds, alterations, purposes, elements, factions, modifications, facts, facteurs, characteristics, limitations, relics, sub-factors, attributes, dimensions, restraints, prerequisites, ramifications, burdens, currents, predictors, indicators, Risks, Strains, changes, enablers, Indices, impediments, constraints, supporters, antiques, trends, revisions, things, causes, Tendencies, barriers, revenues, effets, Antiquities, stressors, promotants, components, variables, Adults, Promoters, avenues, patterns, motivators, stresses, demands, endeavours, features, aspects, reasons, drivers, assessments, flows, Environments, highlights, monuments, Drugs, agents, endpoints, Males, Sons, events, amendments, models, strands, grounds, items, boys, streams, guys, parameters, touches, attempts, tries, effects, incidence. 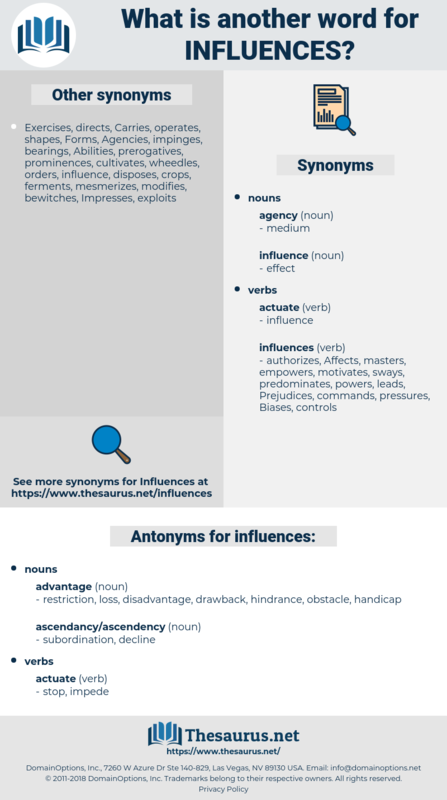 induces, affect, relationships, incites, infects, informs, Upon, relations, interferes, introduces, instigates, contributes, involves, dominates, enforces, undermines, inspires, dictates, factors, concerns, afflicts, impinges, diminishes, Affects, alters, furthers, invests, identifies, entail, Entailed, entails, impairs, governs, threatens, places, jeopardizes, directs, consequences, favours, stimulates, colours, sends, overshadows, hurts, compels, motivates, decides, modifies, weighs, harms, hinders, obliges, defines, regulates, pertains, shapes, allocates, encourages, assigns, impedes, establishes, determines, guides, imposes, prescribes, damages, hits, fosters, deploys, pushes, commits, reflects, leads, urges, amends, hampers, poses, relates, varies, Drives, tempts, prefers, engages, ties, assesses, compromises, permeates, employs, Plays, brings, spends, determinants, appears, appropriates, earmarks, Bears, abets, Strikes, finds, devotes, on, prompts, sets, seems, extends, calls, puts, knows, provides, promotes, requires, looks, applies, draws, spurs, marks, causes, adds, drivers, makes, touches, effects, effect, incidence. restriction, loss, disadvantage, drawback, hindrance, obstacle, handicap. Here is your opportunity, not only of proving your belief in the nobility of women, but of bringing me under religious influences. We must guard the minds of our children from Christian influences.